Digimon History: Kain was born as part of a twin Digimon pair in the digital world - right from the beginning, he had been together with his brother, Abel. As they emerged from their egg in the place where it all began, life was obviously simple - but that was enough for the earliest times and up into the time where they digivolved for the first time, together, as always - two Baby II level Digimon united by a bond of true brothers. However, during their time in this stage, they first met new friends amongst other Digimon. There, a difference became clear between Abel and Kain for the first time - Kain just wasn't any good at talking to people, he was shy and timid. His brother, on the other hand, was quirky, well-loved and quickly became the center of attention of everyone - nobody wasted even one moment for his brother. After a time, even Abel himself stopped to care for his brother much, and so, Kain thought to himself - he had to impress them, if he couldn't talk openly, then he'd at least be someone special. And what better way to impress his own brother and his new friends than to digivolve before they did? Training every day and night, sleeping and eating only the bare minimum, Kain steeled his young body and trained his mind to appreciate his own strength. Accumulating more and more of it, for a Baby II at least, it didn't take him long to actually reach the next level - as a Child Digimon, he took on a form befitting his new-found inner strength and shyness around others, becoming one of the illusive, ever-training Kotemon. Returning to his friends with a Digi-Core swollen with pride and joy, he didn't get the reaction he had hoped for. Instead, it was quite the opposite. His sudden strength intimidated the others - including his own twin brother. In an attempt to look pleasing to the false friends he had allured with words alone, to keep his position, Abel did the unthinkable - to keep being the favored child, he told Kain to get lost, since he had 'changed so much' that he was no longer a brother to him. The resulting anger lead to two things - first of all, to Kain striking down his own brother with one fell swoop, destroying the form of his sibling. But also to Kotemon's feelings of ever wanting to impress someone ever again to die off - instead, his grim, bleak new outlook was simple. 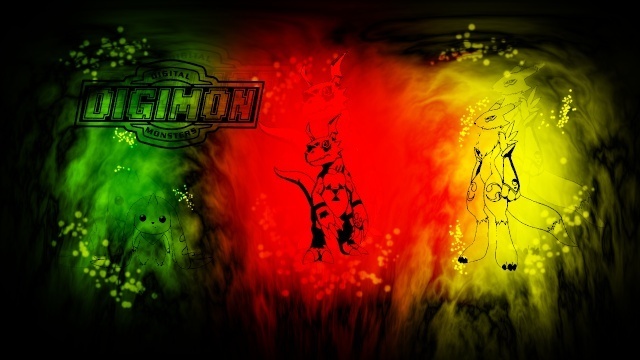 Those strong appreciate strength - to become stronger, he had to fight other strong Digimon. Strength was all that remained to Kain, and thus he began wandering the digital world. During his years of travel, Kain attempted to master the way of the samurai. Without a master to serve, he became a ronin and fighter for hire, serving those that had strength and honor by adding his own. 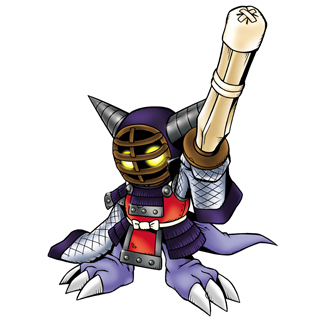 Soon, news of the impending doom of the digital world reached his ears - through ways of a contract from an illusive knight-like Digimon that didn't show him his face. 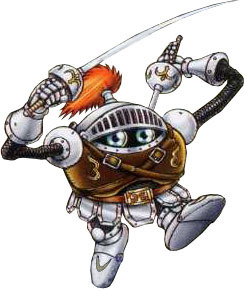 Kotemon accepted anyway, sensing great strength and honor from the masked knight, and thus took it onto himself to stop the doom of his homeworld. First, he needed a way into the real world - so he manipulated a computer at a public library until a somewhat stable portal had been created. Downloading his Kote.mon file onto the computer and executing it, he was able to manifest into the human world - in the confusion spreading around his sudden appearance, he vanished into the shadows to execute his mission. But alas, Kain turned out to be the wrong kind of person to take on a diplomacy mission, but brute force also proved ineffective thanks to a lacking number of supporters of that idea - and thus, the digital world was destroyed, and with that, his contract nullified. Now Kain roams the real world alone, still in search for true strength - and to find out what true strength actually means. Rookie Personality: Kotemon has the personality of a Ronin - a Samurai without a lord to serve, quite simply. He values strength, honor and glory in battle more than anything else, and can be very single-minded onto the goal of getting stronger. His usual approach towards problems is to charge head-on - he is no good with diplomacy and fancy words. People have been known to enlist his services for payment - this payment can either take the form of actual real world money, or other services, such as providing him strong data to load or granting him special rights and services. He determines his price based on the situation. Also, he refuses to work for weaklings and those without a spine, making criminals much less likely to be able to afford his services. While he has a strong sense of justice when unemployed, he will execute his orders without fail once he has a contract. He will usually list at least one condition under which the contract is voided instantly - usually refusing to attack civilians first, or automatically refusing to dishonor himself. Memories of friendship and comrades never leave him and are burned into his Digi-Core - even being thrown back into egg-state would not be able to erase them. Grudges, though, are not something he holds onto for long, unlike rivalry, in which he relishes - any chance to get stronger is good for him. Kain can even seem a bit timid at times, though this only shows when he is not training. He tries hard to be formal, honest and humble, as those are great strengths for a Samurai to have to him. Kain controls most of his anger nowadays, thankfully. Champion Personality: As Gladimon, Kain is prone to making rash decisions. His sense of justice grows stronger, but he is willing to ignore it to get even stronger. As a knight in training, he always aims for the top.